Phew! London has been a sweltering bath of humidity for so long now! It is so very lovely to have the weather, but us Brits are never quite sure how to cope with it! Very few residential homes have air con here in the UK, so countless cold showers and wafting the nearest magazine or leaflet as makeshift fans seem to be the best ideas we seem to have come up with! When the weather is hot and humid food needs to been fresh, light and cool. 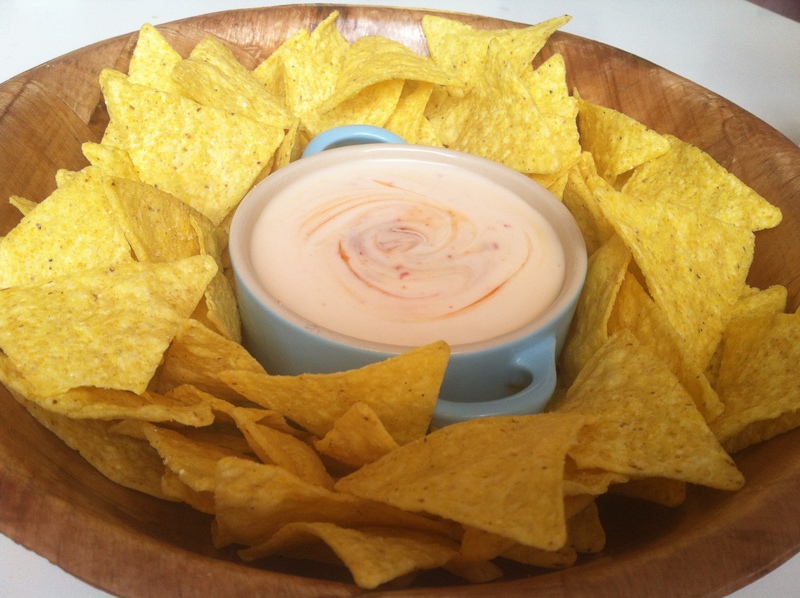 This is a light, tasty and versatile dip which can be served with carrot sticks, broccoli florets, mange tout, crisps, tortilla chips or anything you can dip! Try it, it is so fresh especially when it is lovely and chilled. Perfect with a chilled glass of rose! 1. Mix the creme fraiche and chilli sauce in a bowl and chill for at least half an hour or so before serving. 2. Serve with crudités, tortilla chips or anything you can dip in it! Enjoy! !